Green Kabocha is a sweet, and full flavoured squash. The flesh is an intense orange that cooks up smooth and sweet. The flavour is more full bodied than other squashes. It is best when baked or steamed with skin on. The skin is soft when cooked and can be eaten with the flesh. Wash the squash thoroughly with warm water and a soft brush. Cut the top off and remove only the seeds with a spoon, leaving the natural cavity. Clean and slice the mushrooms. 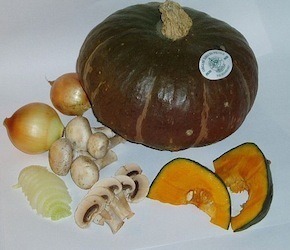 Mix the onions and mushrooms and fill the cavity of the squash. Add oil or butter and water. Season with salt and a dash of ground pepper. Replace the top and bake on rack in preheated 350F oven for about one hour, or until slightly soft to the touch. Baking time will vary with the size of the squash and temperature of the water.